The Finance Linked Individual Subsidy Programme (FLISP), is a South African government initiative administered by the NHFC, for households in the ‘gap’ market—those earning between R3,501-R15,000 a month. FLISP is intended to assist these households in accessing housing, through a contribution by government that ultimately reduces their monthly bond repayments. This subsidy is available for individuals who have never benefitted from a government housing subsidy scheme, are first-time home buyers, have financial dependents, among other criteria. Based on the applicant’s gross monthly income, the once-off subsidy amount can range between R10 000 and R87 000, houses acquired with the subsidy may not exceed the R300 000 house price cap. 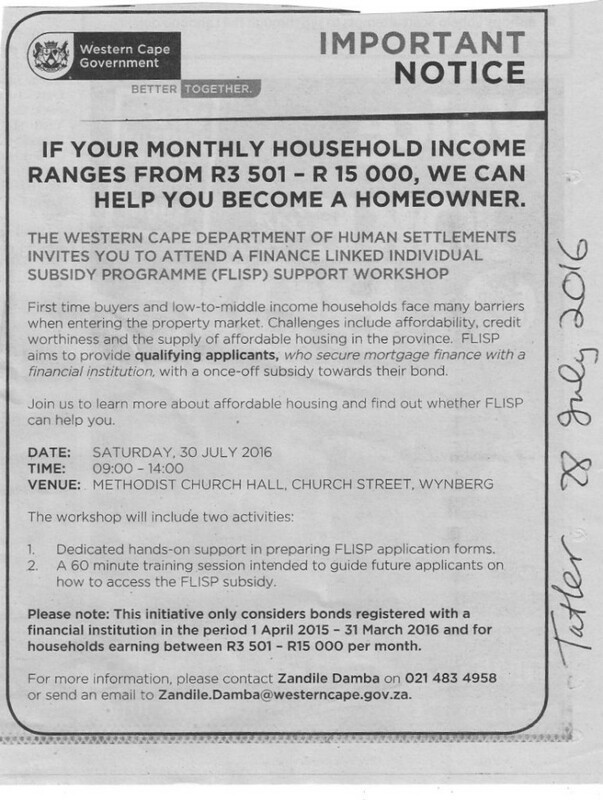 The Western Cape Department of Human Settlements is inviting residents to attend a workshop about the above subsidy programme, the workshop will take place on 30 July 2016. It will entail a session helping eligible attendees with the preparation of their application forms, and a 60 minute training session guiding future applicants on how to access the subsidy. For those interested in submitting an application during the session, only those attendees with bonds that were registered between 1 April 2015 and 31 March 2016 will be considered. Interested parties may contact Zandile Damba on 021 483 4958 or Zandile. Damba@westerncape.gov.za for more information. To date, CAHF has published four blogs on FLISP: wondering whether FLISP would be successful,trying to understand how it would work, celebrating its expansion to the resale market and one answering your questions about the subsidy. These blogs, and two other documents (the FLISP policy, from 2012, and subsidy value tables, from 2015) can be found on our website. How long do I still have to wait for the Flisp subsidy to be paid out. It is already nearly 2months since the registration of the property in the new owner’s name and I am still waiting. Dear Steve Williams, if you live in Free State, Gauteng, Mpumalanga, North West or the Northern Cape: the NHFC must contact you within 21 days of your application. If you have not received a response, you can contact the NHFC to assist you. Another common problem was that many people were awarded the subsidy but do not follow up to receive the funds (once the transfer has gone through). If these problems apply to you, first contact Mathews Sidu (email: mathewss@nhfc.co.za | contact number: 011 644 9800). If you cannot get hold of Mr. Sidu, contact Oupa Mareletse (email: oupam@nhfc.co.za | contact number: 011 644 9800). In the Eastern Cape, Kwa-Zulu Natal, Limpopo or the Western Cape: we don’t know how applications work in these provinces. You will have to contact the Provincial Departments of Human Settlements.